Select the object you want to rename in the object list. You must not select more than one object. 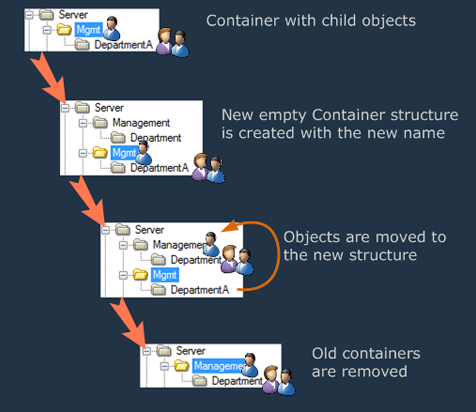 If you want to rename a container object, you also can do that by select it in the treeview panel. Please note the information about renaming containers mentioned below in this topic. Please note that this quick rename is in the object list only possible if you are NOT browsing in deeptree mode and if your objects are displayed with friendly names! Otherwise you see the dialog described in the next paragraph if you press the F2 key. Please read the next paragraph for more information about special characters in object names. There may be situations where the options and buttons for renaming objects may be disabled. This might be if the LEX ReadOnly Mode is active, or when the application focus lays on the attribute list. Originally, the syntax of Distinguished Names was established in RFC 1779 and RFC 2253. In the meantime, the more modern RFC-Specification RFC 4514 applies here. 1. If object names (RDN names) shall start or end a space character, this must be preceded with a leading backslash '\'. 2. If the following characters shall be used in an object name, they also have to be escaped with leading backslash '\'. 3. If object names shall start with a "#" this must be preceded with a leading backslash '\'. Especially for ADS domain controllers or ADAM servers it's a strange effect that the system uses the escaping backslash for the '#' at all position in the name string. Normally this is not necessary, the backslash is only important at the beginning because modern LDAP servers accept a syntax where a name starts with "#" and consist then of a hex code for the name. 4. Additionally, any character can be expressed with it's UTF8 value, encoded with a leading backslash for each value. So in environments where the LDAP server doesn't accept pure UTF-8 strings for distinguished names, you can easily encode all special characters for your object's names. You don't need this encoding in Active Directory environments, because you can use UTF-8 strings with special chars directly as distinguished names. There is a general problem when objects are to be renamed: If the DN of an renamed object was stored in an attribute of another directory object - what happens with this attribute after the rename? References to other objects will be adjusted automatically by the server when objects are renamed. This is true for all attributes with DN content. A special case: There could be references even to objects in other domains in universal groups. This is more complicated, because these are objects outside of the server's own directory domain database. In this scenario the domain controller with the FSMO role 'Infrastructure Master' performs the adjustment for such references. When objects are renamed, OpenLDAP can adjust the references in other attributes, but it needs a special plug-in (a so called overlay) for this: For this purpose you have to activate the overlay RefInt (Referential Integrity, slapo-refint) on the OpenLDAP server. References to other objects will be adjusted automatically by the server when objects are renamed - this is true for all attributes with DN content. Microsoft Exchange 5.5: An Exchange 5.5 cannot handle such references on name changes. Therefore object renaming is not allowed and all trials to rename an object will be suppressed and an error will be returned. Some directories don't allow moving or renaming objects which have child objects. This is also called 'Subtree Move/Rename'. Examples are older versions of Novell eDirectory, or OpenLDAP server where other backend database than hdb-db are used. This LEX technique is called 'Subtree Cloning'. Please note that the containers (and only those) will be NEW objects in this case! If you source container object have important attribute properties, they are lost, because the copy operation of the container structure just takes the object names of the containers and doesn't transfer any attribute! If you want LEX to do the cloning without warning, just go to the application options (menu Tools - Options - Dialogs) and deactivate the Ask for subtree cloning if the directory doesnt support container renaming or moving option -or just click on the Don't show this dialog again.